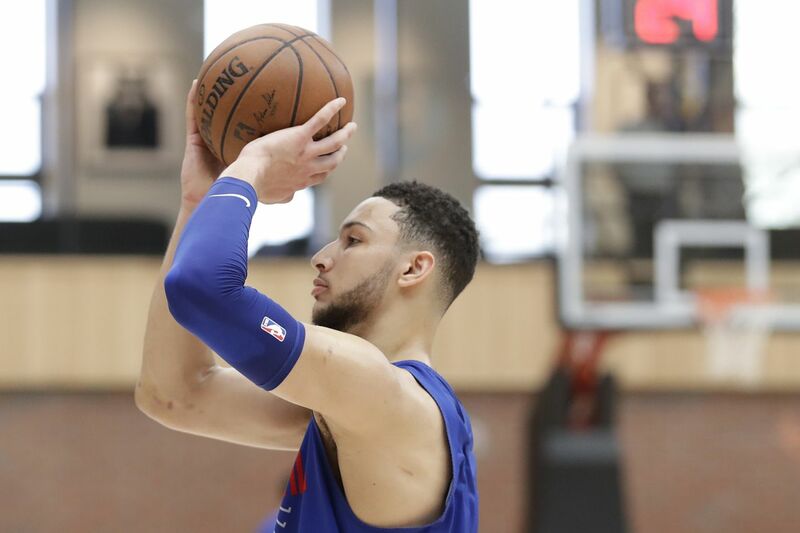 Sixers guard Ben Simmons shoots a free throw after practice in Lavietes Pavilion at Harvard University on Wednesday, May 2, 2018. Ben Simmons has been working on his jump shot this summer with his brother, Liam Simmons, a former college basketball assistant coach. Liam Simmons will continue to work with the 76ers standout at the Sixers' practice facility in Camden until the season begins, according to a source. And it appears they will continue to work together after that. Liam Simmons resigned after a brief stint this spring as an assistant coach at the University of California, Riverside. School sources said he resigned to work full time with his brother. Ben Simmons' godfather, David Patrick, was named the Highlanders' head coach in April. Liam Simmons joined Patrick's staff later that month after four seasons at Southwest Baptist University, where he served as associate head coach last season. Ben Simmons attempted only 11 three-pointers last season (mostly buzzer heaves from half-court and beyond), missing all of them. That didn't keep him from becoming the third Sixer to win NBA rookie of the year. Michael Carter-Williams garnered the honor for the 2013-14 season, and Hall of Famer Allen Iverson was the 1996-97 honoree. Simmons recorded 12 triple-doubles in the regular season, the second most by a rookie in NBA history. He averaged 15.8 points, 8.1 rebounds, and 8.2 assists, and garnered Eastern Conference rookie-of-the-month honors for October/November, January, February, and March/April. The Australian had at least 10 points, five rebounds, and five assists in 58 games last season. That was third behind Russell Westbrook and LeBron James.